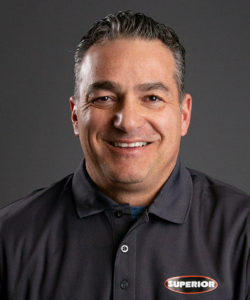 Morris, Minn. USA — Superior Industries Inc., a U.S. based manufacturer and global supplier of bulk material processing and handling systems, says industry veteran Cary Octavio is its new territory sales manager for conveyor components in the Northeast United States. Octavio comes to Superior after almost 30-years of sales and service in bulk material handling markets. To date, Octavio has spent the majority of his career with Fenner Dunlop Americas where he was in outside sales territory development and sales management. Most recently, he was vice president of sales at International Conveyor and Rubber, a Pennsylvania-based supplier of conveyor and rubber products and services. At Superior, Octavio will work with the manufacturer’s distribution partners from Maine to Virginia and all states between. Octavio is a proud veteran of the United States Navy and currently lives in Western Pennsylvania with his wife and their teenage daughter. Additionally, he has two adult children. Away from work, Octavio enjoys fitness activities and has various roles in his church. From Rock Face to Load Out®, Superior Industries engineers and manufactures groundbreaking bulk material processing and handling equipment and cutting-edge components. From its headquarters in Morris, Minnesota, USA, the 46-year-old manufacturer supplies bulk crushing, screening, washing and conveying systems for industries like aggregates, mining, bulk terminals, agriculture, power and biomass. In addition to its home plant, Superior operates from additional U.S. facilities in Arizona, Georgia, Illinois, Michigan and Nebraska; Alberta and New Brunswick, Canada; and three locations throughout Brazil.